Out and about at the new gallery exhibitions this weekend, I noticed some nearly sold-out shows, with red dots signaling feverish sales, and collectors cheerily purchasing the hot commodities. As a critic I don’t usually pay attention to price lists or count the red dots, but it was hard not to notice that multi-thousand dollar artworks were being snapped up at every venue. Gallerists were glued to their phones, pumping handshakes and flashing weird smiles. There’s something exciting about all this but also something a little strange. Erik Wenzel called it “Halloween for a very specific segment of the population,” and it is indeed playfully grotesque. Although I don’t buy art, I had the opportunity this weekend to go shopping with a couple of artists—not at galleries, but at some unconventional marketplaces where the act of shopping seemed an artistic activity itself. In the past few decades, very simple and everyday actions, like walking or eating, have become the newest artistic media. Why not shopping, too? Certainly, shopping is one way that we participate in culture. The shopping eye measures the worth of objects, and tears with desire, and it is vain, seeing itself in things it is not. Lauren Anderson collects eyes. 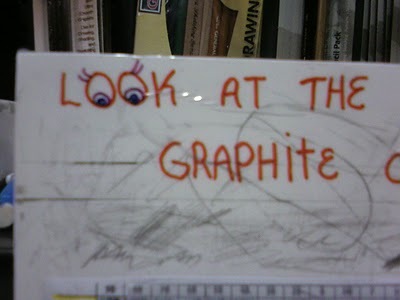 Rather, she photographs hand-drawn signs where eyeballs are placed in double o’s. Hard black pupils sometimes creep into the word “look,” or eyes peep through a $1.00 price tag, and eyelashes grow, creepily, on the word “bathroom.” These are just research photos for a project in development, or they’re just pitifully cute. Many of them are from the Maxwell Street Market, where she and I strolled on a recent sunny Sunday afternoon. We fingered dumpster trinkets and tried to bargain, but were met only with hard sells. We drifted through clouds of odorous boiled pork. The hot sugar-crusted churros were awesome. Although “Faux Weirdo” is her current solo gallery show, at Golden Age, most often I see Lauren’s art by chance, not by seeking it out, at random intervals throughout the city. People hang on to the Lauren Anderson Society bumper stickers, announcing their nostalgic allegiance to a mock Christian woman’s club, now defunct. Lauren’s own favorite work is a printed flyer announcing a hotdog BBQ, and her current series of drawings were made using the shocking colors fired out of children’s smoke bombs. You often see kids shooting these off on the sidewalks in Pilsen, and making these drawings goes hand-in-hand with a summer day. Sometimes the wind blew the smoke from the novelty bombs into Lauren’s face as she made the drawings so that she couldn’t see what she drew. She likes these drawings best. Lauren also has a strong taste for the weird. She seeks it out, and Maxwell Street delivers. Although I’m still not clear what a “faux weirdo” is, exactly, there’s plenty of real weirdo to discover in the world. I asked Lauren why she didn’t leave Chicago like so many artists do. “It’s still weird,” she says. There’s so much weird to excavate here. From the dollar bin she pulled an LP titled “Weird World of Blew Fly” and bought it, then gushed about the “weird kid drawings” she’s found on the street and will remake into a large drawing. She also scored some brightly colored hand-formed clay whistles, with colors like her smoke bomb drawings. Later, as we chatted on a curb, we watched a parade of objects pass us by on the shoulders of their new owners, objects that we had earlier considered buying. It was a little surreal, but it’s these odd coincidences, rooted in common encounters, that seem the most wonderfully weird. This weekend was also the opening of Nick Cave’s soundsuit shop in an empty storefront on the corner of Michigan Avenue and 23rd. At night people gathered at the intersection’s corners and quietly stared, like witnesses to an accident, at the video projections in the building’s windows. Inside was the bumping celebration for Nick’s eight-page spread in Vogue, in the all-important September issue, and a store of branded Nick Cave trinkets. This is great exposure for the artist, who is gaining massive, and deserved, notoriety for his fantastic soundsuits, which are experimental, sculptural-performance couture objects. Unfortunately the soundsuits were not being sold or modeled at the shop, but small items were being sold, and Nick was on hand to sign copies of Vogue. T-shirts with printed gold bling necklaces, notecards and refrigerator magnets with images of Cave’s art were offered at low prices, from $10-$30. These aren’t innovative or artistic objects in themselves, but objects to commemorate Cave’s successes. Sheets of colorful artist-designed wrapping paper, in three different designs, were given out for free to attendees. These are the highly collectible objects most resembling the energy of Cave’s artistic output—that, and the fervent crowd flashing glittering, smiling eyes all over the place.